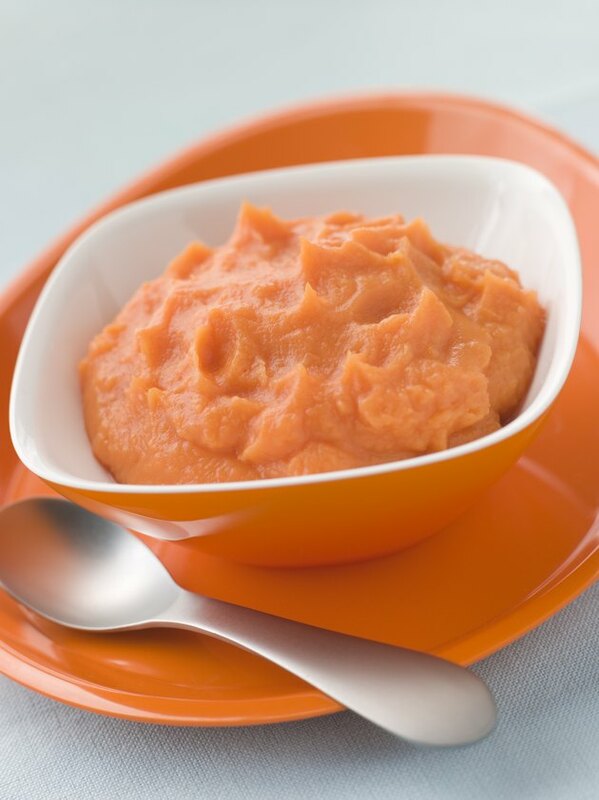 Most babies enjoy the flavor, color and texture of sweet potatoes, according to AskDrSears.com. Sweet potatoes are a smart choice for your baby, because they provide an abundance of nutrients, including beta carotene and vitamin B-6. Also, your infant might be more likely to eat them than other vegetables, because they are sweeter. However, the flip side is that sweet potatoes can cause diarrhea in some infants; talk to a health care provider if this happens. It can be difficult to discern when your baby has diarrhea because their stools are often loose, frequent and soft. However, you should start to recognize what is normal for your baby. When she experiences more frequent or watery stools, or she has more than one bowel movement per feeding, she might have diarrhea. Sweet potatoes can cause food protein-induced enterocolitis syndrome, or FPIES, in infants, an April 2003 article in the journal “Pediatrics” explains. This syndrome is a gastrointestinal hypersensitivity to certain foods, which can cause diarrhea and other symptoms. The article explains that this syndrome is more likely to be the cause of diarrhea from sweet potatoes if the infant already has FPIES associated with soy or cow’s milk. Diarrhea is one symptom exhibited from an allergic reaction to a food, so your infant might be allergic to sweet potatoes. MedlinePlus recommends giving your infant one new food for a few days at a time so you can know the source of the allergy if one develops. Visit your doctor or an allergy specialist if you suspect your child is allergic to sweet potatoes. Although sweet potatoes are a potential cause, your baby’s diarrhea might be caused by something else. Other dietary changes, your diet if you are breast-feeding, antibiotics and some health conditions like cystic fibrosis, are all potential causes of diarrhea in your baby. Keep your infant hydrated and talk to your doctor for more information.